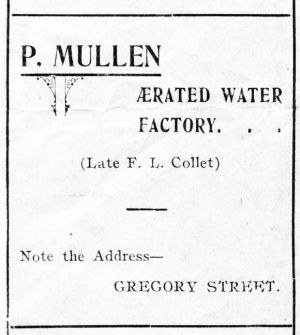 Patrick Mullen operated his factory from premises in Gregory Street. According to an early advertisement he purchased this factory from Fernand Collet. Patrick Mullen, the well known proprietor of Mullen's livery stables, passed away at the District Hospital last Wednesday morning at 6.30, after a short illness. The deceased arrived in Mackay from County Londonderry, Ireland, in 1890. Shortly after his arrival he went to Homebush, where he was employed as a ploughman for the C.S.R. Company. 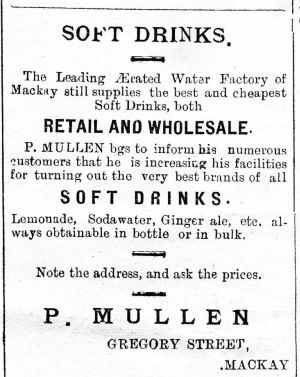 On leaving Homebush he took over the license of the Caledonian Hotel, Nebo Road and later on became proprietor of an aerated water factory in Wood Street. Then he went into the Australian Hotel, and subsequently purchased the livery stables in Wood Street, which he conducted up to the time of his death. He was popular with all who knew him and most obliging. He leaves a widow and four children, Eileen, Anne, Jean and Fannie, to whom general sympathy will be extended. An example of a P. Mullen Marble glass bottle. 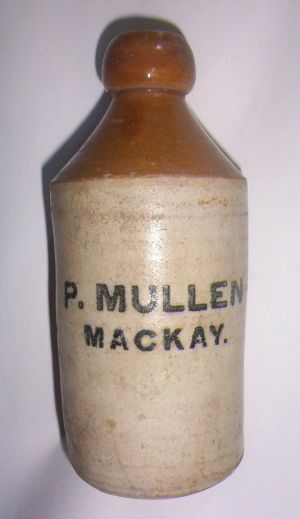 Another example of a Mullen marble bottle. A Mullen blob Top Stone Ginger Beer bottle. A Mullen blob Top glass bottle. Mackay Mercury, April 1, 1905 Advertisement from a Mackay Theatre Program. November 10, 1904.